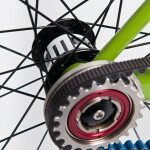 This is the final update on the Project Right bike we’ve been documenting on our blog. Project Right started as a challenging request for an extraordinary bike, a task that was immediately exciting for everyone at Fairwheel. 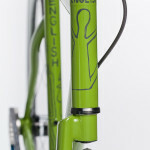 The bike got lots of attention at the English Cycles booth at the North American Hand Built Bike Show in Sacramento. 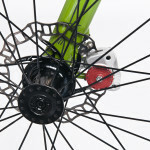 The request came in for a “completely unique” build – a single speed that would stand apart with a completely out of the box approach. If possible the bike was to be be single-sided, similar to the GT Super Bike. A unique finish was exceptionally important, so the fact that our customer is a big fan of Maurice Sendak’s Where the Wild Things Are and the Spike Jonze film adaptation became artistic inspiration. What’s more, the bike needed to function as an everyday rider / commuter for the hills of Seattle, preferably belt-driven for reduced maintenance and increased longevity in the rain. 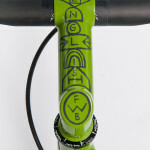 Frame builder Rob English immediately came to mind for the project. 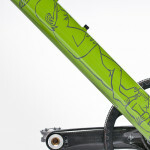 We’ve known Rob for years and have enjoyed working with him during every step of the bike-building process. No one we know gets excited quite like Rob for projects like this. We’ve also worked with Geoff McFetridge, the Art Director on the Spike Jonze film. Geoff’s creativity and skill have been an invaluable contribution to recent projects like the 2009 Light Bike and the 3 Speed Fixed Gear. Teaming Rob and Geoff for this project was a natural. 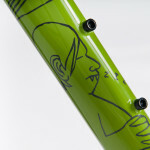 With the frame builder and artist lined up, it was time to pick components. 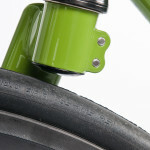 We wanted to go reasonably light while still maintaining the durability needed to be an everyday rider. 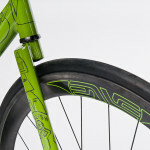 For some components, items that didn’t need to be completely custom but maintained uniqueness with a good strength to weight ratio were chosen – specifically ENVE Composites rims and handlebar, THM Clavicula cranks and a KCNC Headset. 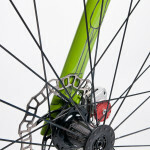 Brakes and hubs got a little complicated – more to come on that. When we talked with Rob about Project Right, his enthusiasm was immediately apparent. With Rob’s custom Di2 integration, aerodynamic builds, and general approach to frame design, thinking outside the box came naturally. 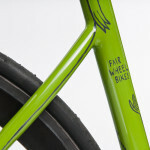 He instantly shared our concept for this bike and quickly got back to us with ideas for designing the rear end, and even the unique idea of putting the freewheel for the belt drive on the outside of the single-arm chain stay. 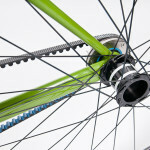 English planned on machining a completely custom hub, using an over-sized fixed axle to increase strength, with an eccentric bottom bracket to adjust belt tension. Rob drew up his ideas, along with calculated strength and weight figures. Did we mention he’s an engineer? 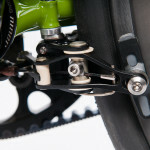 One issue that we’d anticipated was brake placement; this was simply solved by using a disc up front and a road brake mounted under the BB for the rear. 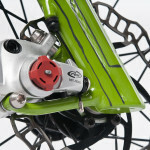 Rob’s assurance that modifying a disc brake to the right side by re-machining the caliper provided confidence in the brake setup. 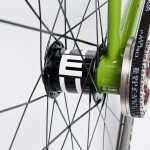 With all these elements coming together, we green-lit Rob’s ideas and spec’d a Tune Cannonball hub, EE brake, and BB7 front disc to complete his enthusiastic vision. 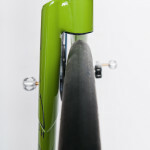 Over the course of the Rob English build process, we received photo updates until the time came for the bike’s green base coat and shipment to Geoff in LA. 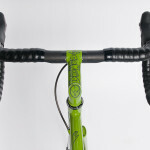 The Project Right bike is, to date, our most unique build and it fits Geoff’s vision perfectly. 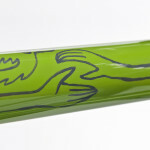 He hand painted characters across the bright green frame, fork and stem in a Where the Wild Things Are style. The characters fit perfectly with the shape and complement every junction and bend. 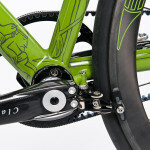 Feet hang under the bottom bracket as if sitting side saddle across the pedal spindle, more feet run down the single seat stay while multiple figures and shapes create what reminds me of a totem pole on the fork. 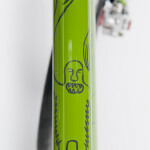 Geoff even painted a design on the quill-like neck of the stem as a surprise to anyone who pulls the headset apart. The vision Geoff brought to this project is completely distinct and really added to the overall feel of the build. 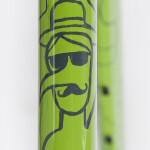 To learn more about Geoff’s work and his design studio, go to his website, Champion Studio. Please note that Geoff is an artist and not a painter, unless budget is of no concern to you, please don’t contact him about custom paint on your personal bike. If you like what he’s doing we ask that you leave a message letting him know on this blog. *Thanks to Rob for keeping such detailed notes on his builds. 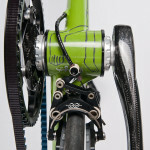 David Haines sat down with Project Right for a bit to document the bike for us. Normally we try to parse the galleries down to around twelve images. This time though, with the detail of the build and the paint, we couldn’t cut any out and ended up with a whopping 31. Enjoy! All images are copyrighted by David Haines. 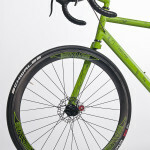 From Road Bike Review’s coverage of NAHBS. 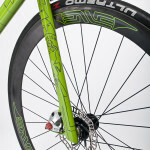 From Road Bike Action’s Coverage of NAHBS. We’d like to offer sincere thanks to everyone involved in Project Right – the people we have the opportunity to work with are truly amazing. Rob reports that the ride is very nice. Looking cool. Is it possible to buy a bike like that? where and how much? Dennis it isn’t possible to just walk into a shop and buy a bike like that, however designing and building something similar but specifically built for you and your needs is certainly possible. 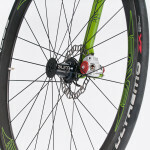 The price can range a lot depending on the parts you choose and the level of custom work put into each one. $10,000 and up would be a good estimate for something like this. 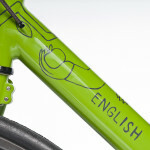 Of course that wouldn’t include hand painting by Geoff McFetridge.